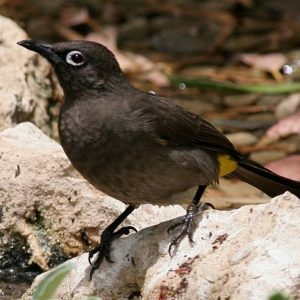 Now known as Cape Brownbul. Has white eye-ring. Immature has brown eye-ring for first few months. Vent is lemon yellow. Often gathers at fruiting trees. fruit, seeds, nectar and insects. 19 to 21 cm Resident fruit, seeds, nectar and insects.